Cyclists, bikers, drivers and car2go dare devils, brace yourself for a change. Bogart Street, often dubbed as Bushwick's Champs Élysées for the stylish crowds parading themselves towards Roberta's, is now a one way street. As of this past week new signs showed up in front of the gallery and artist studio building, The BogArt at 56 Bogart St. The only correct way to drive on Bogart Street is now towards Flushing Ave. The change has affected the section of Bogart St between Johnson and Flushing Aves, and took several drivers by surprise. 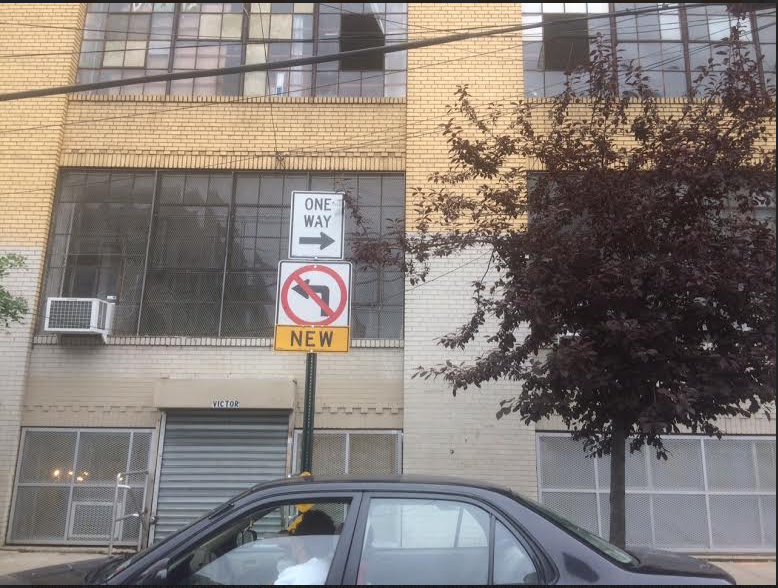 The attempts to redesign the congested industrial street as a one way go all the way back to four years ago when Community Board 1 has requested the change but the Department of Transportation declined it. Apparently, the city reacted to the high amount of conflict between trucks, cars, cyclists, and pedestrians on the narrow road, wrote Brooklyn Paper in January. The redesign has eliminated 12 existing parking spaces, but drivers will be able to park their cars on new 8–10 new parking spaces converted from no-standing areas.